Week Thirty-Five and it has been a week of extreme excitement and hard work on the part of Roger, Tina, Steve with Keith and I helping out. Work has progressed well inside and outside on Hadar. Roger has finished the area where the range goes in the boatman's cabin. 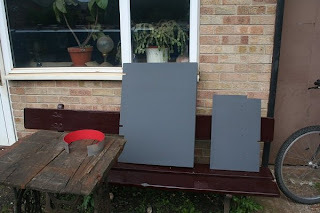 The base is aluminium and the walls are plasterboard. 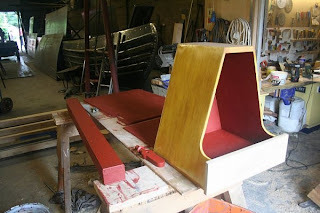 He has also completed fitting the red moulding to the boatman's cabin woodwork. Even young Steve has been working on her, doing various bits and pieces, such as making the fitting for the headlamp to go on the top of the post, the bracket for attaching the klaxon to the slide hatch, and the flywheel and alternator guards for the engine, which are essential to ensure Paddy's tail doesn't get caught in them whilst the engine is running. Calorifier is Now Boxed In. The boxing in of the calorifier has now been fitted which will also accept one of the fixings for the alternator guard. Tina has now completed all the signwriting, and it looks really great. Tina finished the signwriting, Hadar looks absolutely amazing. Tina has done such a fabulous job. With all hands to the pumps, things have been moving along briskly. Many of the smaller fitting and fixtures are being painted, such as the flywheel and alternator covers. Navigation Lights and Cabin Steps. 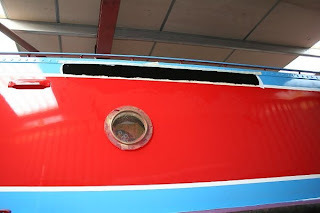 All 4 navigation lights have been fitted and the 4 fold down brass steps on the cabin sides. Although not quite traditional I feel that if working boats had carried on in large numbers that boatman would have opted for such luxuries in later life. Stern Navigation Light and Cabin Step. The stern navigation light will also act as a deck light as it is independantly switched in the boatman's cabin. This will also mean that it can be used in tunnels without having to have all 4 navigation lights on. 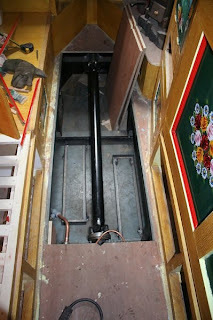 Coal Skuttle, Inner Mast and Boatman's Cabin Floor. 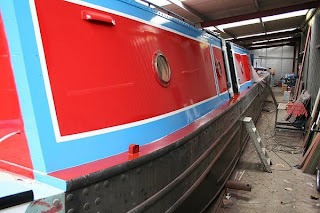 Much of the fittings have started to receive their red oxide and primer coats. For some items such as the coal skuttle innerards and boatman's cabin floor this will be the only coat they will receive. 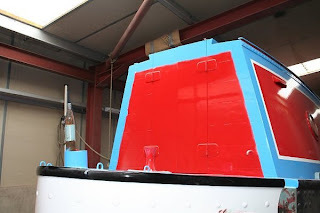 The inner mast will have the upper section painted gloss red, and the lower will remain in red oxide. Fitted Painted Boatman's Cabin Floor. 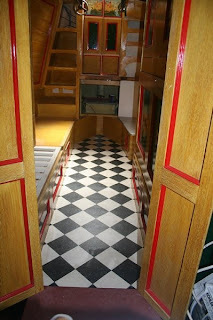 It was a good sign that the boatman's cabin was nearing completion when the painted floor goes down. 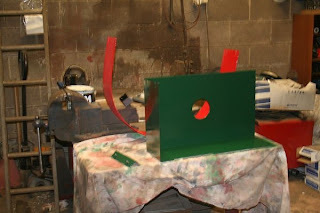 The calorifier box received its coat of primer, and the porthole rings started to be painted. These rings are inserts that fit inside the woodwork, to give a good finish. They are rolled from aluminium sheet. 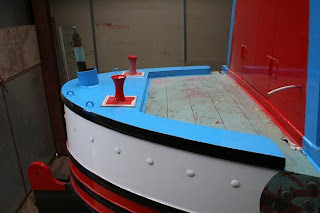 The ones in the boatman's cabin and engine room will be painted red and the remaining ones in the galley and bathroom will be ivory. Calorifier Box and 1 of the Porthole Rings. Preparing the Hull for Blacking. Who let me (Jo) loose with a power tool? 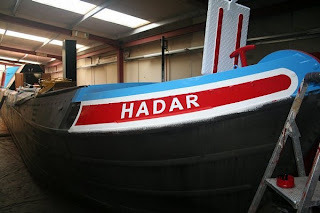 We volunteered to black the hull of Hadar as it would be good experience for when we have to do it in the future. I removed the rust, with the sander, that had accumulated whilst she was in the water for 10 months. Whilst I was doing this Keith was masking off the gloss paint areas which meet the blacked area. 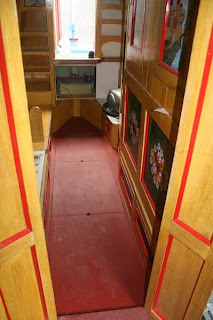 Roger fitted the vinyl flooring to the boatman's cabin floor. We found 2 pieces of this in the corner of the local carpet shop, and got them both for £15. It finishes off the cabin so well, we are both delighted with the look. No Keith did not black the whole of the hull with a 1" wide brush! He was filling in the bits that the roller had missed. We rollered the blacking on having seen both this method and brushing it on, and the roller method is definitely easier and quicker. 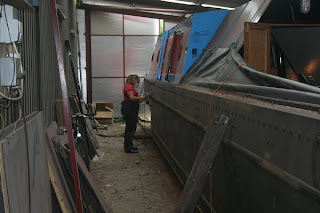 As we were blacking the hull this meant that Tina could get on with finishing painting other parts of the boat so that she is ready to come out of the paintshed next week. 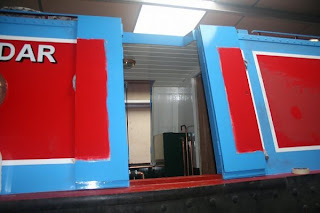 This included the final set of roses on the boatman's cabin doors, and hopefully the final coat of blue on the inside of the engine room doors. Completed Blacking from the Bow. We finished the blacking late in the afternoon. We both were very tired, a 70ft boat takes a lot of blacking. We both slept well that night. Completed Blacking from the Stern. Finally for the week Keith finished the blacking by going over the bits that were a bit thin. This was evident on the sections painted over previously unblacked areas, especially where she had been painted in that very light blue holding coat. He also did the sections where the access ladders had been the previous day. 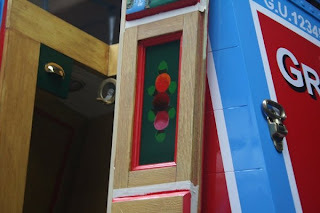 Tina finished the roses on the boatman's cabin doors. Jo was busy making the curtains for the back cabin. It was an extremely manic week, but very satisfying to watch and be apart of. 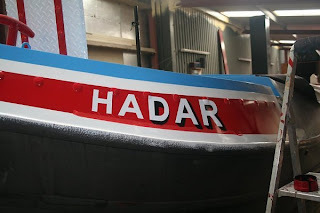 Roll on next week when all being well there will be photographs of Hadar coming out of the shed, so watch this space. It has been an extremely busy week in the paint shed for Hadar, and a very exciting week for us as we watched her get her signwriting. It is wonderful to see Hadar actually written on her, she now has her identity. Seeing the signwriting done, makes you appreciate that is is not as easy as it looks. Tina has really done a wonderful job. Just to show that both sides are receiving the same treatment. The bow names were masked off ready for the shadowing. Bow Name Prepared for Shading. Port Side Shading Partly Completed. 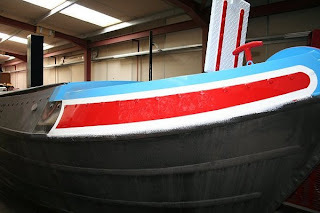 The start of the shading to all the signwriting at the stern began. Starboard Bow Name has Received it's Shading. 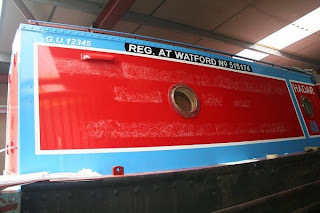 The start of the shading to all the signwriting has begun with the bow name. 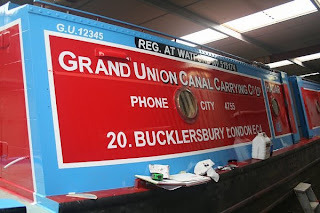 The Completed Grand Union Canal Carrying Co. Signwriting. 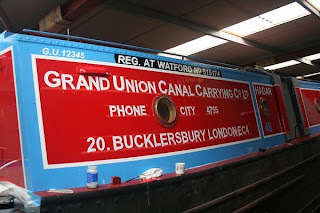 The Grand Union Canal Carrying Co. Signwriting was completed except for the shadowing. The lower picture shows it after the masking tape had been removed. The Masking Tape is Removed. 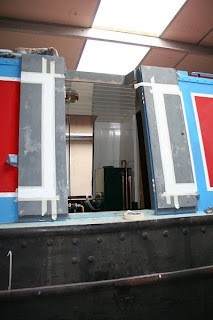 The engine room doors received a coat of blue on the inside. 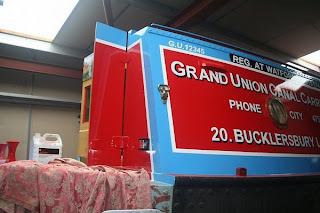 The final coat will be the last of the major cabinside paintwork, leaving just the signwriting to be completed. 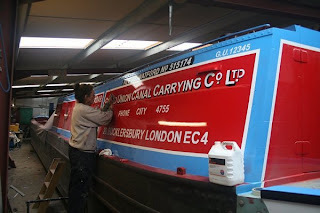 Talking about signwriting this is progressed really well. Starboard Side Shading at the Stern started. Starboard Side Shading Partly Completed. 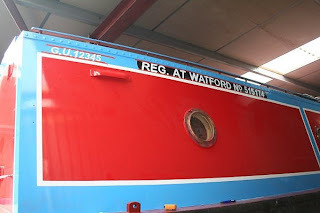 The shading of the signwriting was completed on the starboard side. 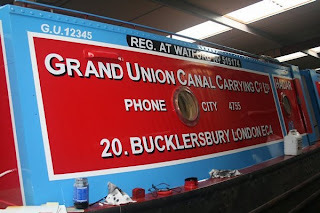 Completed Shading of Signwriting on Starboard Side. The port side is progressing. Note how Tina starts from the right and signwrites to the left, this is because like Keith she is left-handed. 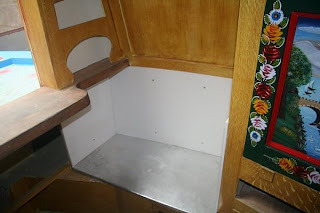 Roger and welder Steve fitted battery boxes below the boatman's cabin floor. 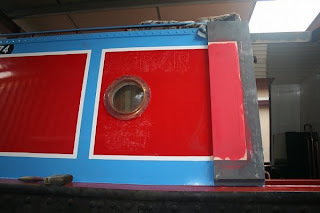 You can also see some of the red moulding has been fitted around the various edges of the woodwork in the cabin. 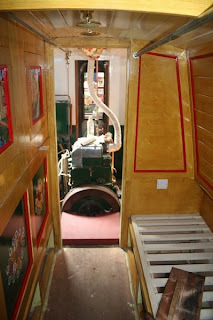 More of the red moulding can be seen below, along with the raised floor in the engine room which covers the propshaft. 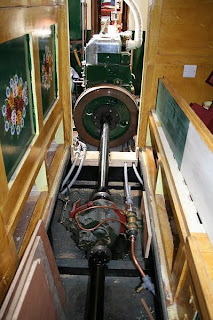 This would normally be level with the boatman's cabin floor, but because the flywheel is so large and the engine thus sits very high, it has had to be raised to clear the propshaft. Week Thirty-Three got off to a flying start, with Tina being very busy in the hold. Red Oxide on the Hold Bulkhead. Engine Room Doors Coachline Masked Off. She also painted the lower section of the hold bulkhead red-oxide to match the inside of the hold. Black Registration Bar on Cabinside. Tina painted the black registration bar on the cabinside. 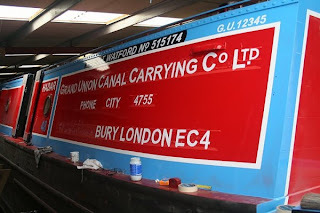 This was now ready to receive the signwriting for the BW registration number. 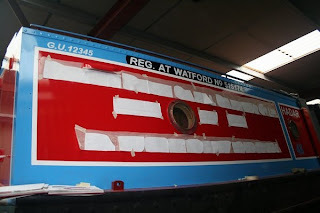 She also masked off the coachline on the engine room doors ready to apply the red and blue panels. The Registration Number in Chalk. Then some tape is put above and below the writing and then it is a case of painting the letters/numbers in place. The First Few Letters and Numbers. 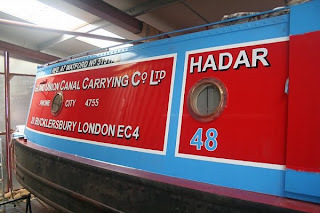 Hadars Name on the Bow in Chalk. Tina started the signwriting today. First she creates the leters/numbers on tracing paper and then covers the other side with chalk powder. This is then held in place and the letters/numbers traced around the outline, leaving the chalk on the boat to create a rough guideline. 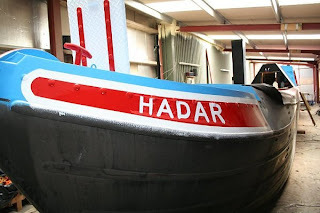 Hadars Name on the Bow. The signwriting is progressing well. 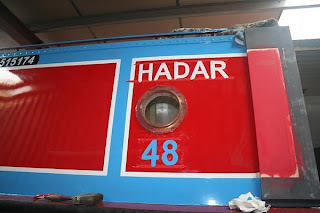 Hadar's name is taking shape on the bow. The Reg No is complete along with the gauging number, this is actually her BWB index number. 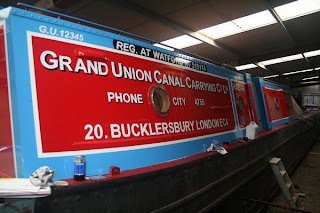 Every narrowboat was given a gauging number so that cargoes could be charged according to their depth as measured with a gauge, hence gauging. The gauging of a narrowboat consisted of measurings its depth below the water level, to ascertain how much cargo was being carried. This gauged depth was then compared against records for the boat using it's gauging number to ascertain how much cargo in weight was being carried and thus how much toll could be charged. Start of Hadar and Fleet No. 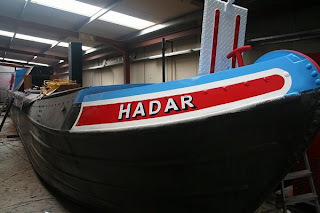 Hadars Name and Fleet No. Chalked on. The signwriting progressed really well. Tina chalked Hadar on the cabinside and the fleet number below. 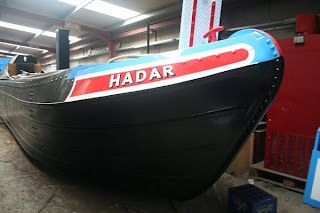 She then went onto paint Hadars name and Fleet No. She removed the tape from the Reg & gauging No.s. 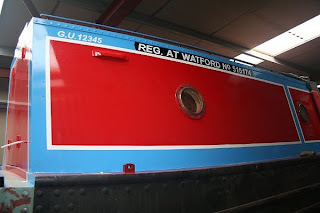 She also painted the red section of the inside of the engine room doors. 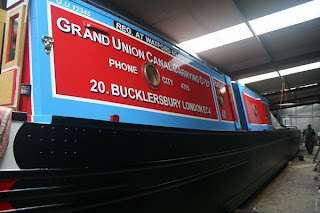 Chalked on Grand Union Canal Carrying Co. Details. 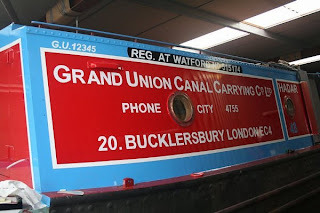 Stencils for the Grand Union Canal Carrying Co. Details. More signwriting progressed. Tina attached the stencils for the details of the GUCCCo. Then having traced all the lettering and removed the tracing paper she can tell whether everything is all lined up before starting the painting. Our's as you can see has been another week of high activity on the painting front. 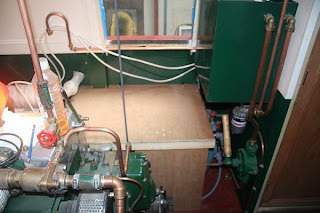 Roger has now finished the engine room fitout except for the electrics. 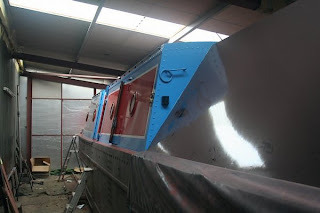 Tina has been busy painting the counter with it's first coat of blue, and the cabin rear and doors have had the first coat of blue around the edge. 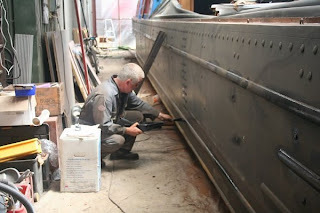 She has also been finishing off around the edges of the galley side doors, and has now finished the engine room hatches. Cabin Rear Receives a Coat of Blue. 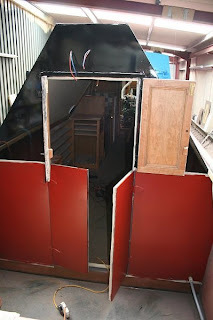 She has also made a start on the inside of the engine room doors. They are painted to match the outside scheme so that when the doors are open the colour scheme is continous. This was a fairly common practice with the working boats. 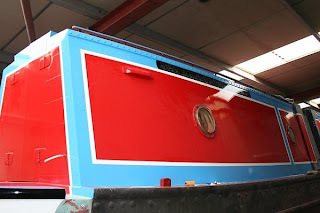 She has masked off the white coachline and has painted the first coat of undercoat. 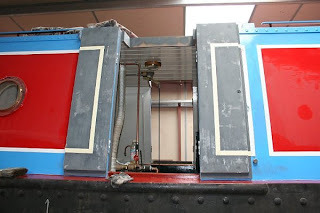 Engine Room Doors Receive the White Coachlines. Having been fortunate enough to watch the painting in progress, we realise just how much is involved with hand painting a boat. It is a real work of art and is not to be rushed. These are the now completed engine room hatches. 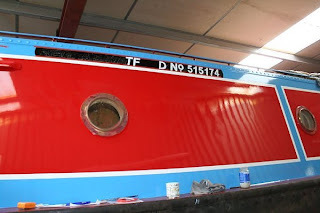 Tina has now painted the gunwales alongside the cabinsides red oxide. The remaining gunwales alongside the hold will be blacked along with the hull. 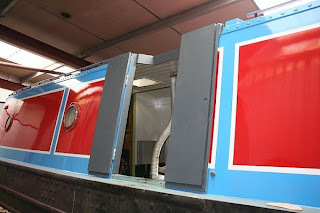 The white coachlines on the inside of the engine room doors have now had their first gloss coat this morning. 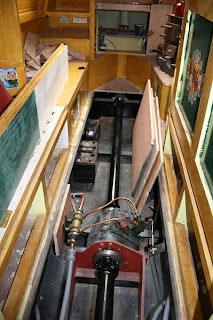 Roger has now fitted the 2 propshafts to the engine, gearbox and stern tube. As now can be seen having the gearbox mounted under the boatman's cabin floor we have 2 short propshafts rather than the normal single long one. This should reduce any potential for windup, or whip in the propshaft. Windup is where one end of the shaft rotates more than the other, as the shaft twists, and whip is where centrifugal force can cause a long shaft to rotate off-centre near it's mid point. By having 2 short shafts these 2 effects are dramatically reduced. Propshafts towards the Stern Tube. 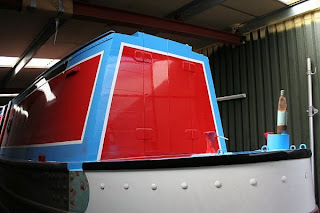 The painting has been progressing with the tiller having received it's red and blue bands, with just the white central band to go. The edges of the cabin side doors and engine 'ole doors are almost finished. 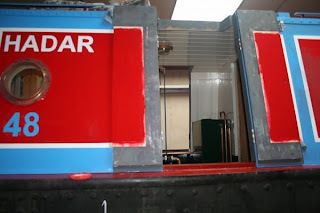 Tina has now undercoated the inside of the engine room doors. 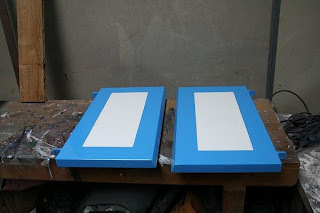 These doors will be painted to match the outside paintwork, so that when the doors are open, the colour scheme is continued. All will become apparent when the doors are finished.